After visiting each home page, it was clear that one stood out from the others for the strong positioning it gave to content designed to impact student recruitment: Arizona State University. A “can’t miss” box to “Find my degree program” by either title or keyword search, with a split between undergraduate and graduate interest. Clean, simple, nicely placed. Finding the academic programs offered is a Top Task for nearly all student searching for a college to attend. This placement guarantees that it is quick and easy to do at ASU. A rotating mention of various ASU rankings. A “Contact my admissions representative” box, again with options for undergrad and graduate interest. After those 3 content boxes, an “I am a future…” line of links to 7 easy-to-scan student types, staring with “Freshman student” and ending with “Online student.” Some of these, of course, might overlap. Picking the right student audiences to include is always a challenge. Just beneath that grouping are 3 highly visible links to either “Visit ASU” or “Request Information” or “Apply.” Including links for both those ready to just inquire and those ready to apply is appreciated. Too often only a link to “apply” is visible. And there’s more here as you move down the page: 8 large content blocks that include links to a video tour and the honors college. Note the use of “Find my degree program” and “Find my admissions representative” as well as the “I am a future…” heading. Words like this break the bureaucratic tone that often plagues higher education websites. 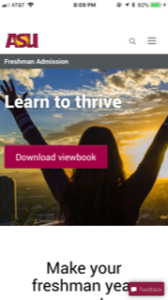 As potential future freshmen move deeper into the site they will come upon an invitation to “Download viewbook.” And that viewbook is a 16-page PDF for a “Learn to thrive” 2018 recruitment magazine. As with almost all conversions of a print publication to PDF format, this one is challenging to read on a desktop or laptop without increasing the size of each page. On a mobile phone? Near impossible. The bottom line: using PDFs like this is lazy. Inconvenient. Frustrating. Just cruel and unusual punishment that should not have prominent position on a website in 2018. If the content deserves a place with your student recruitment web content, convert it to a visitor-friendly format. 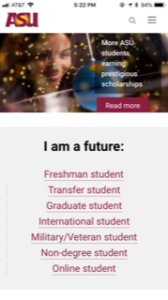 Visit a major public university home page with an unusually strong focus on student recruitment at Arizona State University.